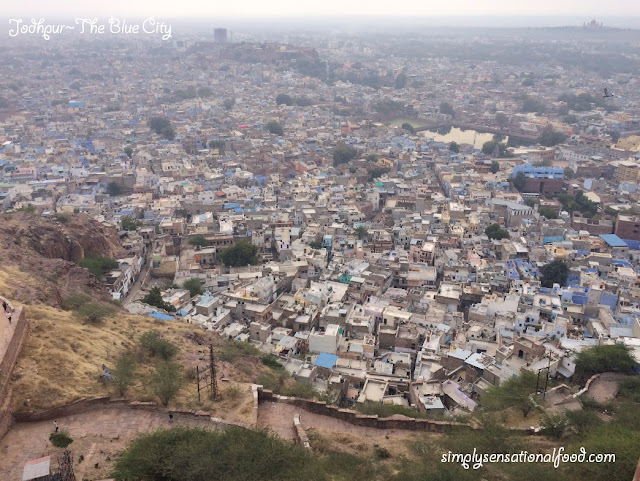 Chickpea Tikkis (cakes) and Saffron Soul book review. It has been ages since I added a cook book to my collection. 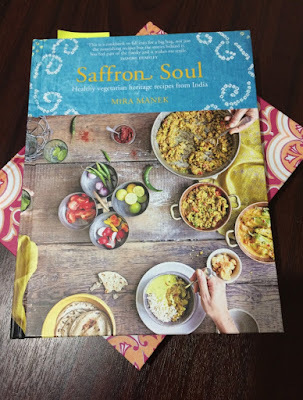 Saffron Soul by Mira Manek, is more like a journal than a vegetarian cook book, exploring her family's traditional recipes that she has grown up with. I like this book as it shows the author's personality and heritage which is similar to my own and it brings back my childhood memories of learning to cook with my mother and grandmother. The book features many recipes shared by her family, together with new fusion recipes that have been inspired and adapted with ingredients of this day and age. The recipes are easy to follow and beautifully illustrated. Other than the recipes, I loved reading the snippets of personal family history the author has shared together with her family photos. There are many recipes in the book that I have grown up with and I can see similarities, however I also loved the fusion recipes such as Warm curried courgetti salad with maple chillied seeds, Quinoa Bhel on chilled watermelon and the Spelt and quinoa rotis. **I was sent a copy of the book to review as always all thoughts and opinions expressed are my own. 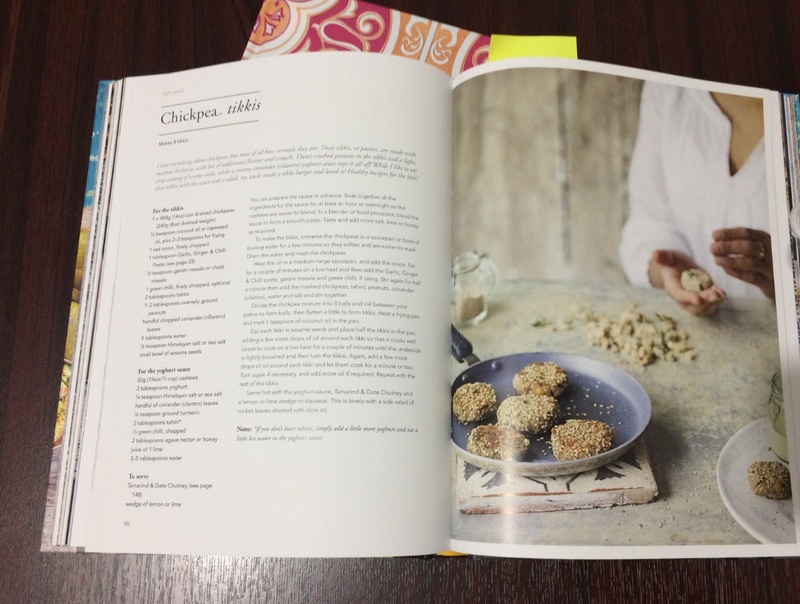 I have chosen to make the Chickpea tikkis, which are savoury cakes from the book. I have recreated the recipe with a few minor changes. 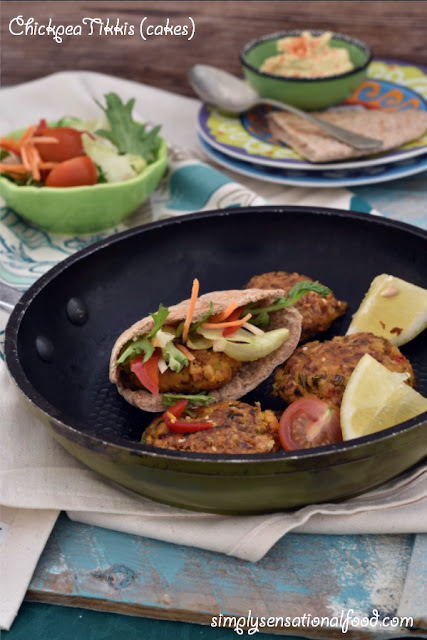 Chickpea pattis cooked with spices and herbs and shallow fried. 240 g Pre boiled white chickpeas. 1. Put the chick peas in a large bowl and coarsely mash them with a potato masher.2. In a frying pan add 1 tablespoon of oil and when its hot add the spring onions and red chilli and saute for 2 minutes.3. Add the salt, chilli power, turmeric powder, coarsely ground peanuts and the mashed chickpeas. Mix together and cook for another 2-3 minutes until all the spices infuse.4. Take the mixture off the heat and allow to reach room temperature. Once cooled add the chopped coriander, lemon juice, corn flower and water so that you can bind the mixture into small golf sized balls.5. Flatten the balls into pattis and roll them in sesame seeds. Place on tray and chill f pattis or 30 minutes.6. Heat the remaining oil in a frying pan and shallow fry the pattis in small batches until golden brown on both sides, remove from pan and drain on kitchen paper.7. To serve toast some pitta bread and spread the inside with hummus, add salad and chick pea pattis and serve with lemon wedges. Nice Review.. Haven't had this Chicken pea before, will try it out myself someday..
Aww, they look delicious. I had falafel burgers last week, a bit similar. Now that I saw these I want them too. Sesame seeds must give the tikkis a lovely flavour. O those look delicious and a great meal! 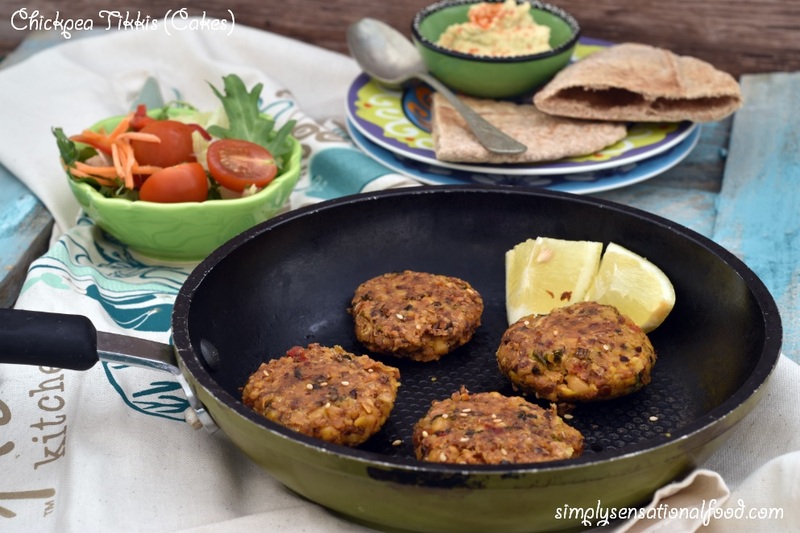 I love anything chickpeas and loaded with great spices! These look great! THe cookbook does, too. I will have to try to get it at my library to see if I would like to buy it. THanks for sharing! You've given it a very high score. I should be adding this to my collection too. These look so good! This books sounds so good since you gave it such a high score! I'm going to have to grab one for myself! Nice book and review, I like those recipes which are passed down in the family. Tikkis looks tempting. I love chickpeas and haven't tried it prepared this way. This looks so good. I might have to try to make this. Thanks for the recipe! I love the idea of the recipe book being a bit more then just that. 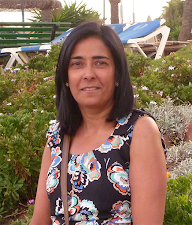 An insight into the authors back ground and life. The dish you whipped up looks incredibly delicious too. I can imagine how flavorsome these chickpea tikkis cakes are, with all those spices in them. They seem really easy to make as well. These look so good! Bookmarked for when I need a quick snack/pick me up! 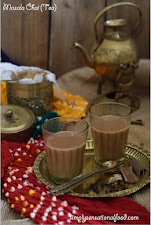 Nice Review and Recipe Also thanks to Share.. This sounds like a wonderful book full of fantastic recipes. I must add it to my list! I have never tried this type of recipe, but it looks scrumptious enough to give it a shot. Thanks so much for sharing! This recipe sounds delicious! I like chickpeas but never really know what to do with them so I'll definitely try making this myself. Delish recipe. I haven't bought a cookbook in ages. This looks like a great addition. Yum these look so good! I have to try these and they look super healthy! Delicious looking tikkis.. The addition of peanuts must have given a different flavour to them. This sounds like a cookbook that my husband would love. I am adding it to his Christmas wish list. I love recipe books that are more like stories. I always wished I'd spent my childhood baking with my matriarchs but food was/is a very tough topic in our family :-/. Now trying to figure out if I can make these for my husband without him realising how healthy they are! I would definitely try these out! Look delicious! These are perfect for vegetarians! I once had a chickpea pattie burger at a local restaurant because I couldn't choose the meat option at that restaurant, and that was the first time I was trying a chickpea pattie. This is a great recipe, will try it soon. Looks delicious at the same time healthy too. I often makes it obviously My version of it. My family likes it. I haven't heard this recipe before. How did you like it? Especially with a picky eater, it's great to know. Thanks. Looks yum! 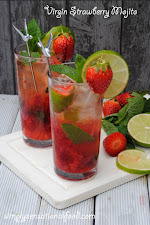 I could try this one soon since the ingredients are all readily available in the market. Thanks for sharing your recipe! Sounds super interesting. 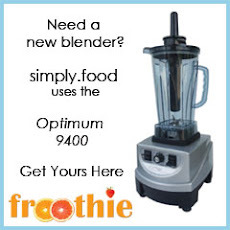 And it is good that the ingredients should be pretty easy to get. These look amazing! 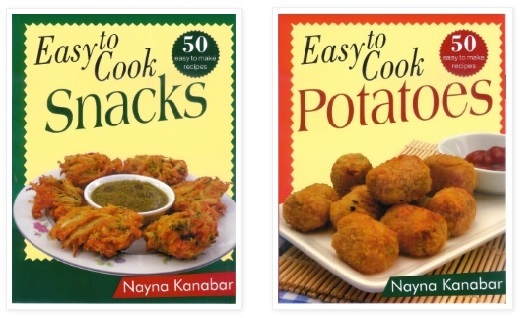 I am always on the look out for quick and easy veggie recipes for dinner etc - these look perfect! I'm going to have to check this out! Looks great! I love recipe books that tell a story of how dishes were enjoyed in a family or how they were created around friends. It makes for a delicious meal and read. I never had chickpea cakes before but I am assuming this would taste heavenly. I love buying cookbooks that contain something like heirloom recipes that you can't find anywhere. Thanks for the review of the Saffron Soul cookbook. I want to go and pick up a copy! I saw a picture of this creation on Instagram. Looks so good! These chickpea tikkis look delicious. A perfect starter/snack and so easy to make! Mmmmmm these look so good! I would definitely love to give them a try one day! This sounds like a cookbook I would adore! I need to look for it...and those chickpea cakes look fab ! 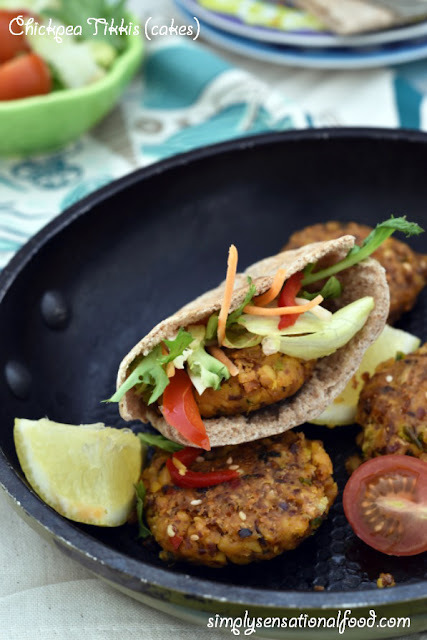 This vegetarian recipe looks amazing:) I never would have thought to use chickpeas in patties, this looks so delicious. Thanks for sharing this cookbook and recipe. I'll have to look out for this book. 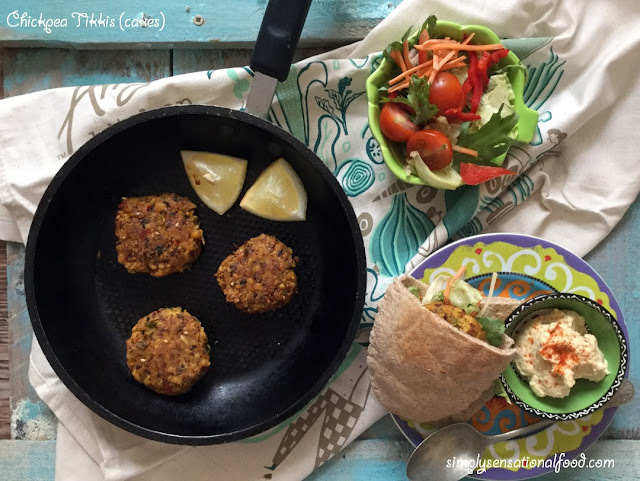 I've tried making chickpea patties once only but wasn't happy with the outcome. Gotta try this recipe!